Welcome to the University of Wyoming School of Pharmacy. Our Doctor of Pharmacy program is nationally accredited with a 100% job placement rate. Our graduates' first-time pass rate on the NAPLEX is consistently over 95%, and our post-graduate residency placement rate is consistently well above the national average. Classes of 52 students assure each student maximum individual attention within our PharmD program. In addition to the PharmD degree, we offer an online Master of Science degree in Health Services Administration for new and mid-career pharmacists and other healthcare professionals who want to become department directors, patient safety coordinators and/or directors, regulatory compliance officers, clinical research associates, health outcomes researchers or advance practice pharmacists. Finally, our Medical Laboratory Sciences program is offered at UW-Casper. Career opportunities for graduates of this program can include working as a Medical Laboratory Scientist, Clinical Systems Analyst, Educator, Forensic Scientist, Health Care Administrator, Laboratory Manager, and more! 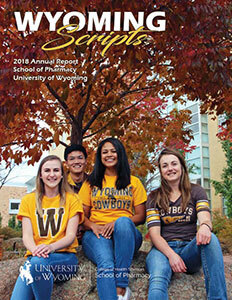 The University of Wyoming School of Pharmacy community is committed to supporting and promoting individual and collective excellence in teaching, research, service and pharmacy practice. We value responsibility, compassion, respect, and integrity in all endeavors.